Inspire him to dress well for your date. Show him our outfit lookbook for different occasions before you go shopping or gift him these clothes. V-Day is exactly one week from now, and if you're coupled up and have a big date planned, we're sure a hot new date outfit has been on your mind (we've been bombarding you with outfit ideas since January!). But since guys generally don't fret as much over their wardrobe as women do, sometimes they need a hint, especially when it seems their clothes look the same in all your date photos. Show your guy our lookbook of complete outfits that will go with whatever you two have planned for the Love Month. 7 For All Mankind and Energie offer a range of basic tees, smart-looking button-down shirts, laid-back jeans, trim trousers, and cozy outerwear he can mix and match. They're perfect for casual dates like an intimate night in, a dinner-and-movie date, or a group inuman date with your barkada. If he's planning to take you out on a formal dinner date or Valentine show, have him peruse the men's line Mundo by The Ramp Crossings while you do some V-Day shopping of your own at your fave department store. Launch the gallery to see over 50 looks that will inspire him to put together a stylish ensemble of his own for your date. 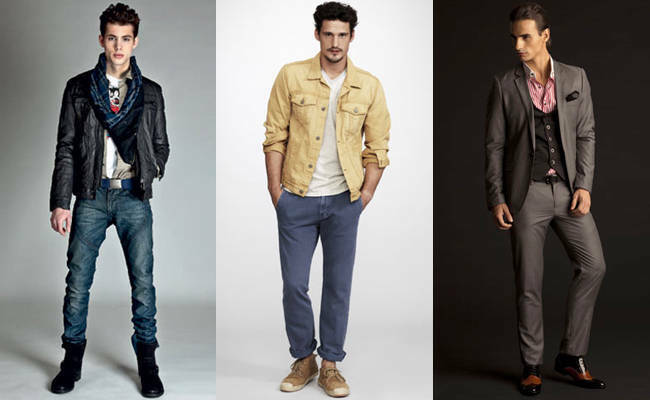 7 For All Mankind has stores in Greenbelt 5, Power Plant Mall, and TriNoma Mall. Energie is available in select SM Department Stores, Urban Athletics Greenbelt, Complex Store Eastwood Mall, and Ayala Center Cebu. Mundo is available at The Ramp Crossings, which has stores in Glorietta, TriNoma, Quezon Ave., and Shangri-La Plaza Mall.